Our goal is to bring you the best patient experience possible, through compassionate and skilled caregivers, a healing environment and outstanding outcomes to help you achieve your optimum health. At Firelands Regional Medical Center, it’s our family caring for yours. As we care for you, we want you to know what to expect and have your questions answered upfront. We want you to be discharged knowing you had all of the information you needed during your stay with us, and when you go home. We take your safety seriously. Firelands is the recipient of the Healthgrades 2017 Patient Safety Excellence Award™, a designation that recognizes superior performance in hospitals that have prevented the occurrence of serious, potentially avoidable complications for patients during hospital stays. The distinction places Firelands among the top 10 percent of all short-term acute care hospitals reporting patient safety data for its excellent performance as evaluated by Healthgrades, the leading online resource for comprehensive information about physicians and hospitals. Primarily all private rooms to improve the control of infections and provide for your comfort. You will be accompanied to your room on admission and to your car upon discharge. We assure your HIPAA rights and personal privacy will be honored to every extent possible. If you are being admitted to the OB unit, there is enhanced security. For baby’s protection and your peace of mind, every nurse wears identification with a photo, so you can easily recognize staff. You, dad and your baby will all have identically numbered bracelets secured to you and your baby at birth. Once you’ve delivered, our staff will explain the other special security system in place. Visiting hours, which are 10 a.m. to 8:30 p.m. daily, for most units. Please note: the inpatient behavioral health unit has different visiting hours. Hospital quiet time is from 8:30 p.m. to 7 a.m., during which we ask patients, staff and families to speak quietly, turn phones on silent or vibrate, and ask staff what might help patients rest. Lights will be dimmed on units and in patient rooms. You may contact the Patient Advocacy department at 419-557-6572 through confidential voicemail or by contacting the hospital operator. You may contact the Ohio Department of Health Hotline at 1-800-342-0553 or 614-466-7217. You may contact the Centers for Medicare and Medicaid Services Quality Improvement Organization (QIO) at 1-800-589-7337 or 216-477-9604. Hospitalist – this is the attending physician who takes care of patients during their hospital stay but does not see patients outside of the hospital. Your primary care physician typically won’t come to the hospital but will be consulted while you’re here. Registered Nurse (RN) – Your nurse will change every 12 hours due to shift changes. When your new nurse comes into your room, he or she will write their name on your communication board so you know who they are. In the interest of your good health, smoking is not permitted anywhere in the hospital or on the campus. Firelands Regional Medical Center is committed to providing our patients with information and support for healthy living. We maintain a smoke-free environment for the safety and health of our patients and staff. If interested, we offer Smoking Cessation Classes that are available after your discharge. Telephone services are provided free of charge to all patients at Firelands Regional Medical Center. To make a local call, dial 9, area code, and then the local number. To place a long distance call, dial 8, then 00 and follow the instructions. In-coming calls will be connected to patient rooms from 7:00 am to 10:00 pm. Outgoing calls may be placed at any time. You can be called directly and at any time without the switchboard’s assistance by giving family members and friends the number of the telephone next to your bed. Text telephone (TTY) is available for hearing-impaired patients by notifying your nurse. Use of cellular telephone cameras is prohibited in all areas to protect the privacy of our patients. Patients/Guests may use the FRMC_Guest wireless connection to access the Internet. After admission at Firelands Regional Medical Center, you will have the opportunity to select your menu from several appetizing choices within your prescribed diet each day you are here. Television service is free of charge for all patients in the hospital. The pCare Patient Education Video System has a wide range of health related education videos, relaxation videos, free airline entertainment, and on-demand movies. Instructions on how to access pCare can be found in the inside pocket. The Channel Guide for all network channels can be found on channel 7. You or your family may give the admitting clerk the name of your place of worship when you are admitted. This information will be made available to clergy. You may request the services of local clergy by contacting the operator (dial 0) and ask to be connected to the Patient Advocate. Also, Firelands main campus meditation rooms are open 24 hours a day and are located on the 2nd floor adjacent the elevators near the cafeteria and in the atrium of our Professional Center I building. The Firelands south campus meditation room is located on the 3rd floor next to Stein Hospice. 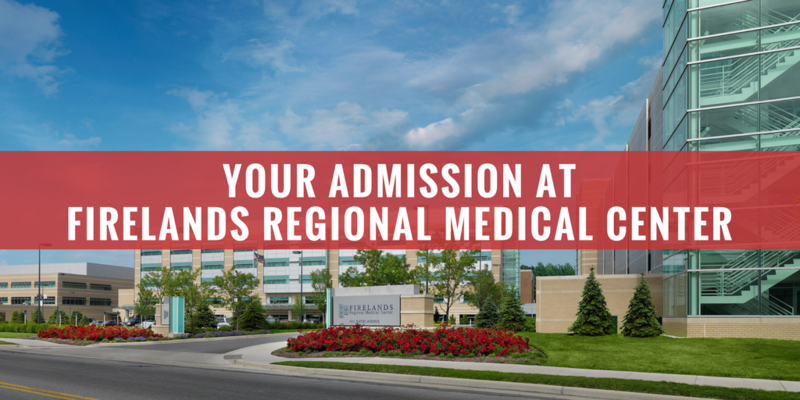 For more information about what to expect when you are admitted to Firelands Regional Medical Center, watch the video below.